Boston lets a two-goal, third-period lead slip away in a 4-3 loss. 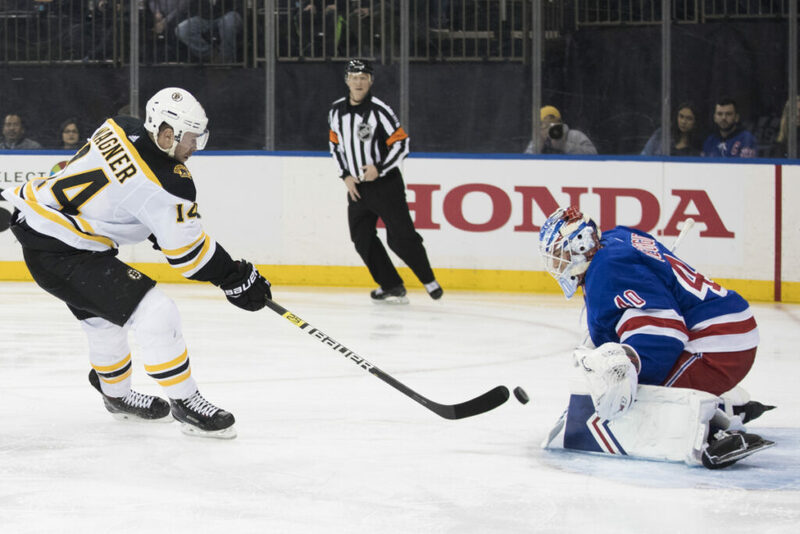 Zibanejad and Marchand scored in the third round of the tiebreaker, and the Rangers won it when David Krejci missed on the Bruins’ last attempt. Trailing 3-1, the Rangers pulled within one at 9:24 of the third when Jimmy Vesey sent a centering pass in front and Hayes poked it past Halak. Chytil then tied it on a power play, knocking in the rebound of Pavel Buchnevich’s slap shot from the left side with 7:19 left. First, Matt Grzelyck’s slap shot from the left point deflected off Heinen and past Georgiev with 9:23 left. It was Heinen’s seventh goal of the season. Pastrnak then put Boston ahead with his 31st, deflecting a pass in front by Krejci into the right side. Bergeron, who played in his 1,000th game Tuesday night in a home victory over the Islanders, gave the Bruins a two-goal lead, tipping Torey Krug’s pass in front for his 19th goal with 4:49 remaining. It was Boston’s third power-play goal in 17 chances over the last six games. The Rangers outshot the Bruins 12-8 in the first period. Boston’s best chance came on Chris Wagner’s short-handed breakaway less than 2 1/2 minutes in. NOTES: Pastrnak has six goals and 13 points in his last 10 games. … Marchand has 11 assists and 14 points in his last nine games. … The Bruins have lost nine of the last 10 meetings (1-7-2) against the Rangers. … New York won the first meeting this season, 3-2 at Boston on Jan. 19. The teams conclude the season series March 27 at Boston.